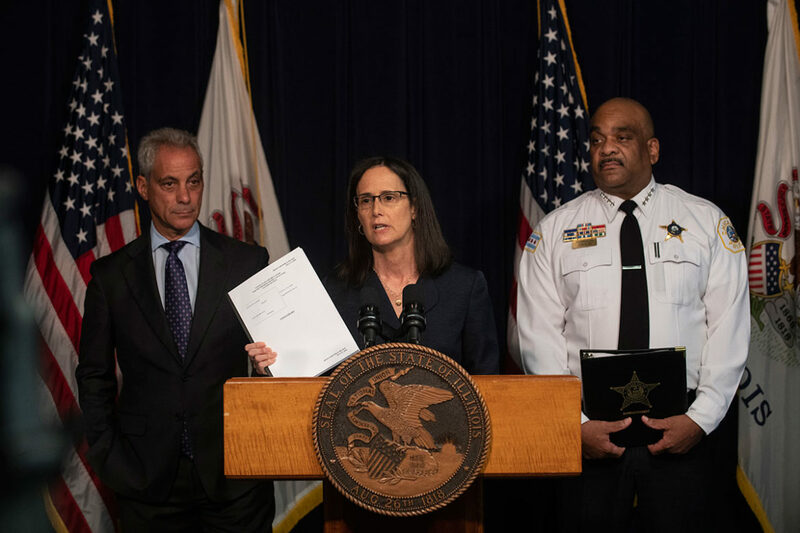 Illinois Attorney General Lisa Madigan holds a draft of a consent decree to reform the Chicago Police Department, flanked by Mayor Rahm Emanuel and police Supt. Eddie Johnson at a press conference on July 27, 2018. After months of negotiations and anticipation, Illinois Attorney General Lisa Madigan and Mayor Rahm Emanuel released a draft consent decree for police reform today. The 223-page document includes hundreds of provisions on use of force, crisis intervention, supervision, transparency and officer wellness, which will dictate the policies and practices of the Chicago Police Department for years, if not decades, to come. The consent decree includes many of the reforms suggested by the Police Accountability Task Force and U.S. Department of Justice reports, both issued in the wake of the release of the Laquan McDonald shooting video in November 2016. Unlike those suggested reforms, though, the consent decree will come with an independent monitor empowered to track and oversee reforms and a federal judge who can force the city’s hand if it doesn’t implement them. 1) It’s still going to be a while. Nothing in police reform happens overnight. The attorney general is giving the public 21 days to submit comments, via a website, phone number or email address. After that, the consent decree will be finalized and presented to Judge Robert M. Dow, the federal district court judge overseeing the lawsuit. Once he signs off, it will go into effect. Even then, the consent decree recognizes that many of the reforms will take years to implement. The draft gives the city until 2020, for example, to create a case management system for police misconduct complaints that allow members of the public to track the status of their complaints online. CPD also has until 2020 to increase the number of licensed mental health staff in the department’s Officer Support Program to 10 from the three they currently have. And the department has until 2021 to implement a full 40 hours of in-service training for officers every year. All that to say that it will be many years before the consent decree is fully implemented. 2) They don’t have it all figured out yet. The city and attorney general acknowledged what has been widely reported, that they are still negotiating over one issue: whether officers will be required to report every time they point their gun at someone. At Friday’s press conference, the mayor noted that this recommendation did not appear in the PATF or DOJ reports and Superintendent Eddie Johnson said he didn’t want to put officers in a position where they might hesitate. Madigan noted that this provision exists in other consent decrees and that pointing a gun at someone constitutes a “seizure” under the Fourth Amendment, and so it should be tracked. Although both sides agreed to continue negotiating in good faith, it’s clear that this is an issue on which they remain far apart. Madigan said this is something she’s willing litigate if she has to. 3) The police union wants its day in court. The Fraternal Order of Police filed a motion last week to be formally recognized as a party in the consent decree lawsuit. Police unions have used this tactic before to stall or even block potential reforms in other cities, including Pittsburgh and Los Angeles. If successful, the union could derail the entire process. FOP President Kevin Graham has called a consent decree “a potential catastrophe for Chicago” and last week FOP spokesman Martin Preib called the lawsuit “bizarre” and said it will “effectively undermine policing in Chicago.” The judge could rule on the FOP’s motion as early as next month. Even if the FOP fails in its efforts to become a party to the consent decree, they could still use the collective bargaining process to derail and delay reforms. The consent decree requires the city to “use its best efforts” to negotiate changes to the collective bargaining agreements, such as removing the prohibition against anonymous complaints and the requirement that COPA notify officers of the name of the complainant before interviewing them. The FOP is sure to fight hard against these changes and others in the contract negotiations, which are technically ongoing but have stalled until after the 2019 mayoral election. After a new contract is ratified, the FOP could also use the arbitration process to push back against consent decree provisions or even take the city before the Illinois Labor Relations Board. 4) The consent decree leaves open the question of civilian oversight. The Grassroots Alliance on Police Accountability, a coalition of community groups, proposed a draft ordinance in March after nearly two years of meetings and negotiations about what kind of structure and powers a civilian police oversight body should have. (Full Disclosure: The Chicago Reporter is an editorially independent program of the Community Renewal Society, which is a member of GAPA.) On the same day, the mayor’s city council allies issued alternative proposals for bodies with much weaker power and much more mayoral control. Those proposals, along with a proposal for an elected Civilian Police Accountability Council, are still pending before the City Council. The draft consent decree doesn’t take a position on what civilian oversight of the police department should look like, but it does indicate that the city can’t get out of some kind of civilian oversight body just by signing the consent decree. It remains to be seen which civilian oversight proposal will win the day. But the makeup, responsibilities and effectiveness of the eventual civilian body could have a significant impact on whether the public trusts the institutions that are going to be responsible for carrying out the consent decree provisions: CPD, COPA, the police board, the deputy inspector for public safety, and the mayor’s office. 5) A lot will ride on the independent monitor. Along with the consent decree, the city and AG also released on Friday a request for proposals for firms or individuals hoping to serve as the independent monitor to oversee the implementation of the agreement. In the past decade or two, a cottage industry of former law enforcement officials, attorneys, and consultants has developed around police reform and consent decree oversight. Given the size of CPD and the scope of the consent decree, the monitoring team is likely to be large and will potentially include different firms or agencies with a range of expertise. The monitor may also employ specific subject-matter experts to review certain provisions. It will be a lucrative contract for whoever gets it. The RFP says the city expects to cap the monitor’s expenses and fees at $2.85 million a year, but the AG thinks it might be more. (For comparison, the fees for the independent monitor over the Baltimore Police Department, which has 2,600 sworn officers to Chicago’s 12,000, is almost $1.5 million.) The city and AG will jointly review applications, and the public will have the opportunity to question the finalists at a public forum. The monitor will be required to review new CPD policies, conduct community surveys, audit the city’s implementation of the consent decree, and file semiannual public reports. But the consent decree leaves open a lot of the details about the format and nature of the monitor’s audits and reports. The public’s faith in the consent decree process may depend a lot on who is selected as the monitor and how well they keep Chicagoans informed throughout. Ald. Ariel Reboyras seeks to weaken civilians’ potential role in police accountability by drawing from purely advisory bodies in Los Angeles and Seattle.